Bear had done right by me when he cleared out his room. Per instructions, he left the books for me to pick through. And the Legos. There were four or five plastic containers full of the red and yellow and blue and green and gray blocks. There were some block blocks–squares and rectangles. There were some windows that opened and closed. There were also a few doodads that could turn around like a faucet or maybe could be a flower. There were bodied and disembodied yellow heads to pick through. And an amazing number of little gray connectors that must have been from the many Star Wars and knights kits that were under Christmas trees and gifted for birthdays. I found Legos to be a wonderful mindless manipulative. It wasn’t mindful for me, as I didn’t focus or concentrate on my creations. I’d sometimes make a color pattern, but, for me, it was always indeterminate. The Bear and the Big Guy spent many hours assembling and disassembling roads, houses, towns and worlds. It was the journey of a Creator, trying different combinations, making evolution happen and then reshaping a next one. There were kits that were constructed following the guidance on the box. But only once. After it was made, it was rejoiced and then deconstructed and the spoils added to the pile. There were no Lego trophies that were saved for posterity. Legos made fluid sculptures. On Saturday, I returned to my boxing duties, back to the Bear’s room. I cleaned out the craziness in the closet. I don’t believe that the back of that closet was cleared out in fifteen years. Frankly, it was scarier in thought than in fact. For some reason, there was a big pile of coins on the dresser. Next to the pile, there was a box full of even more coins, as well as with a bunch of little rocks. Why don’t people (in my family) recognize that nickels and dimes and quarters and, yes, even pennies, are money to be spent rather than items to pile. There was once a day when I ordered a pizza only to realize that I had no cash (before delivery took credit cards). I paid for the pizza with coin I conjured from pockets, under the pillows on the couch and from the bottom of my bags–even going to the closet to rummage through every bag I owned. The Pizza Hut guy wasn’t particularly jazzed, but at least I found enough silver to include a decent tip. I picked through the rocks (why rocks in that box, too??) and tossed them as well as a number of wires and quite a pile of empty wrappers that made me both relieved and a little shocked. I parsed through the books, fondly putting some in boxes and others in the to-go pile. I soon found myself sitting on the floor picking through those Lego boxes. I started tossing out the tiny green army men I found in one box. There was some nerf bullets in another and a fuselage of a plastic airplane. The dust in the uncovered bins was charring my fingers and making me sneeze. 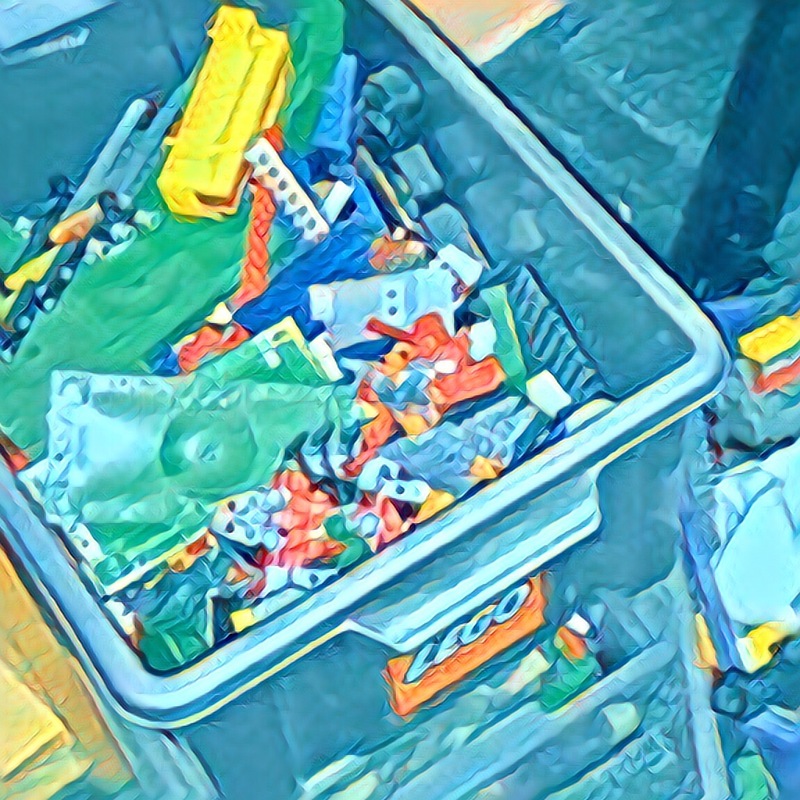 I started combing through one of the bins to shake out the chaff, the unique Lego plastic-on-plastic sound whistling as I shook through the box. Seriously. What. The. Hell. Was. I. Doing. I was spending fifteen, soon to be thirty and likely sixty minutes going through old toys. That had more than a decade of dust on them. I said I wasn’t sentimental and here I was. On the floor. Picking through junk. Nope. Nope. Nope. Done. Said my sane self. I took a photo of the boxes of little colorful blocks and posted them under FREE on my neighborhood listserve. I identified them as dusty and recommended running them through the dishwasher. In less than ten minutes I had a a taker. In five more minutes I took the two trips downstairs and to the front porch to await pickup. I had two more pings for them before I took the listing down. I went for a beer and a sandwich and when I stepped on to the porch I looked down. They were gone.